Rio de Janeiro (BRA), 6 August 2016 – It’s not everyone’s idea of the perfect rehab for a serious head injury, but Britain’s William Fox-Pitt defied all the odds to take the early lead as Olympic Eventing got underway at Deodoro Olympic Park in Rio de Janeiro (BRA). Riding the 16-year-old stallion, Chilli Morning, the man, who spent two weeks in a coma after a fall while competing in France last October, threw down a great dressage score of 37.00. “All along Rio has been my target, totally. It was unrealistic, but it was mine. I was in a coma for a couple of weeks and my sight was quite dodgy; I went from blind to seeing double so when I started jumping there were two jumps. It’s been a journey, but I’ve had so much support!” said the 47-year-old rider. He was chasing the target of 37.60 set by Australia’s Christopher Burton and his regal nine-year-old gelding, Santano B, whose expressive performance was greeted by a roar of approval from the crowd. But when Fox-Pitt went out in front, the gentlemanly Brit was rewarded with another huge response from the spectators. His result, added to the 47.20 achieved by Gemma Tattersall with Quicklook V, leaves Team GB in third before the remaining 31 horse-and-rider combinations take their turn in the dressage phase Sunday. Just behind Burton in the individual rankings is defending team and individual Olympic champion Michael Jung from Germany who scored 40.90, and with his compatriot Sandra Auffarth in fourth with Opgun Louvo the Germans head the team rankings followed by Australia in runner-up spot. There is plenty of pressure on the remaining team members Sunday, because just 1.4 points separate the two leading sides, with the British only 0.3 further behind. A total of 33 horse-and-rider combinations stepped into the arena and it was Auffarth, ninth to go, who set the leading score at 41.60 before the lunch-break. Her test was not flawless, however – “I made a mistake and that made me make another one!” admitted the rider, who took team gold and individual bronze at the London 2012 Olympic Games. Burton’s young Hannoverian drew gasps of delight from the crowd as he floated through extravagant extended trot to go out in front, but Fox-Pitt swept the 44-year-old Australian off the top of the leaderboard with a test the British rider said “is what dreams are made of!” And when the man they all fear most, the phenomenally consistent German Michael Jung, had a hiccup with his Badminton winner Sam, then the top of the first-day leaderboard wouldn’t change. “I made a stupid mistake in canter. It wasn’t because he was nervous; we just lost a little bit of communication,” Jung explained. Fox-Pitt was his usual modest self. Talking about his ride with Chilli Morning, he said, “He’s good on the flat, capable of doing a very good test and I didn’t want to let him down. Today he felt happy and calm, but there are a lot of good horses to come and it will be what it will be,” he pointed out, looking forward to the next two phases. He feels Chilli Morning will tackle it without difficulty, however. “There are no worrying fences out there for him, fence six (brush corners) is ugly, but the one I really don’t like is the corner to the gate (fences 23/23, The Malmesbury Cottage), there are just four strides to do it in, and with Chilli that’s a big question because he’s big and strong,” he added. He has two team silver and one bronze Olympic medal already in his trophy cabinet, but an individual one has proved elusive during his spectacular career. He has given himself every chance of putting that to rights this time around, but there is another day of dressage to go before the individual and team leaderboards take shape ahead of what looks set to be a thrilling cross-country challenge on Monday and a nail-biting conclusion in the jumping arena on Tuesday. FEI OLYMPIC HUB: For further information visit the FEI Olympic Hub which is dedicated to all things Olympic and Paralympic, both old and new: here. Equestrian sport has been part of the Olympic Games since 1912. Team and individual medals are awarded in three disciplines – Dressage, Eventing and Jumping. The equestrian events in Rio will be staged in the Deodoro Olympic Park, the second largest Olympic cluster, alongside basketball, BMX, canoe slalom, fencing, hockey, modern pentathlon, mountain biking, rugby sevens and shooting. The countries represented in Equestrian in Rio are: Argentina, Australia, Austria, Belarus, Belgium, Brazil, Canada, Chile, China, Chinese Taipei, Colombia, Denmark, Dominican Republic, Ecuador, Egypt, Finland, France, Germany, Great Britain, Ireland, Italy, Japan, Korea, Mexico, Morocco, Netherlands, New Zealand, Palestine, Poland, Peru, Puerto Rico, Qatar, Republic of South Africa, Russia, Spain, Switzerland, Sweden, Turkey, Ukraine, Uruguay, USA, Venezuela and Zimbabwe. Lausanne (SUI), 4 September 2015 – The world’s two leading event riders are sharing the top spot after Dressage at the Land Rover Burghley Horse Trials (GBR), sixth and final leg of the FEI Classics™ 2014/2015. William Fox-Pitt, a record six-time winner here, has raised the stakes with a brilliant performance on CCI4* first-timer Fernhill Pimms which equalled the Olympic champion Michael Jung’s (GER) score of 34.2 on FisherRocana FST yesterday. Fox-Pitt took on the ride on Fernhill Pimms, an 11-year-old by Ard VDL Douglas, in 2013. The horse was produced in Ireland by Portuguese rider Duarte Seabra for Carol Gee, who owns him with Catherine Witt. Fox-Pitt won the prestigious young horse CIC3* at Blenheim (GBR) in 2013 on the bay gelding and finished fifth at Bramham CCI3* (GBR) this year. In contrast, Sam Griffiths (AUS), who is lying third on Happy Times with a score of 36.8, has the security of knowing he is on one of the most experienced horses in the sport, let alone at Burghley. The 16-year-old by Heraldik, also the damsire of Michael Jung’s La Biosthetique Sam, has been placed five times at Burghley. “He’s always very consistent on the flat, but he really pulled out the stops today,” said Griffiths, who is also equal 14th on his 2013 Badminton winner Paulank Brockagh. Griffiths’ compatriot Andrew Hoy has now slipped a couple of places to fourth on Rutherglen, with just a 0.9 penalty ahead of another hugely experienced combination, Oliver Townend (GBR) and the 16-year-old Armada. They brought the afternoon to an exciting conclusion when scoring 38.7. Tim Price (NZL), riding the Irish Sport Horse gelding Ringwood Sky Boy, is in sixth place; he will be aiming for a first placing at his fourth attempt at Burghley. Michael Jung (GER) on his second horse, La Biosthetique Sam, is sharing seventh place with another German first-timer at Burghley, 20-year-old Niklas Bschorer on Tom Tom Go 3, on the healthy score of 38.7. Frenchman Cedric Lyard is ninth on Cadeau du Roi ahead of British first-timer Rosalind Canter (Allstar B), 10th, who is hanging on to her spot ahead of a cluster of experienced antipodeans including five-time Burghley winner Sir Mark Todd, equal 12th on Leonidas ll. Oliver Townend will be first out onto the course at 11am tomorrow on Dromgurrihy Blue; follow the action on www.burghley-horse.co.uk and www.burghley.tv and, in Britain, on BBC Red Button. Use hashtags #FEIClassics and #Eventing. Lausanne (SUI), 4 June 2015 – William Fox-Pitt (GBR), the multiple Olympic, World and European medallist, is back as world Eventing number one after victory in last month’s Mitsubishi Motors Badminton Horse Trials, fourth leg of the FEI Classics™. He had held on to the world number one slot for a year until last month, when Michael Jung (GER), who became the first Eventing athlete to hold the European, world and Olympic titles simultaneously in 2012, jumped to the top of the FEI World Eventing Rankings for the first time in his career. Fox-Pitt and Jung have now switched places again, with Fox-Pitt holding a 15-point lead over second-placed Jung. The USA’s Boyd Martin is in third, just one point ahead of Andrew Nicholson (NZL) in fourth on 486 points. Four of the world’s most successful female Eventing athletes are now in the FEI World Eventing Rankings top 10. Jonelle Price (NZL), fifth, is just 50 points ahead of London 2012 Olympic team gold medallist Ingrid Klimke (GER) in sixth, while Belgium’s Karin Donckers has dropped one place to eighth. Nicola Wilson (GBR), London 2012 Olympic team silver medallist, now completes the top 10 after her meteoric rise from 18th, and slots in just 21 points behind Jonelle Price’s husband Tim in ninth. View the full FEI World Eventing Rankings here. Fox-Pitt, who scored individual bronze at the FEI European Eventing Championships 2013 in Malmö (SWE), has helped Great Britain to six of its 14 European team golds. However, the last European Championships marked the first time in 20 years that Great Britain had not won a team medal. Fox-Pitt will be looking to set this record straight at the Longines FEI European Eventing Championships 2015 at Blair Castle in the Scottish Highlands on 10-13 September (see video here). William Fox-Pitt (46) represented Great Britain throughout his teenage years, winning individual silver at the Junior European Championships in 1987, Young Rider team gold at the European Championships in 1988 and 1989, and completed Badminton at the age of 20. His first Burghley win five years later established him as a regular on the senior British team and guaranteed him a ticket to the Atlanta 1996 Olympic Games. He has since represented Great Britain consistently, winning team silver at the London 2012 and Athens 2004 Olympic Games, and team bronze at the Beijing 2008 Olympic Games. He secured team gold and individual silver at the Alltech FEI World Equestrian Games™ 2010 in Kentucky (USA), team silver at the FEI World Equestrian Games™ 2006 in Aachen (GER) and team bronze at the 2002 edition of the Games in Jerez (ESP), as well as six European team gold medals, one team bronze, two individual silvers and individual bronze. Fox-Pitt has also won a total of 55 CCIs (international three-day events), including a record 14 CCI4*s, which are the world’s top international events: Badminton (2004 and 2015, when he became the first rider in history to win there on a stallion), Burghley six times (1994, 2002, 2005, 2007, 2008 and 2011 when he became the first rider to win a record six Burghley titles on six different horses), Luhmühlen (2008), Pau twice (2011 and 2013) and Kentucky three times (2010, 2012 and 2014). Badminton, UK, 10 May 2015 – William Fox-Pitt (GBR) claimed his second Mitsubishi Motors Badminton Horse Trials title riding Chilli Morning after a thrilling final day’s competition. 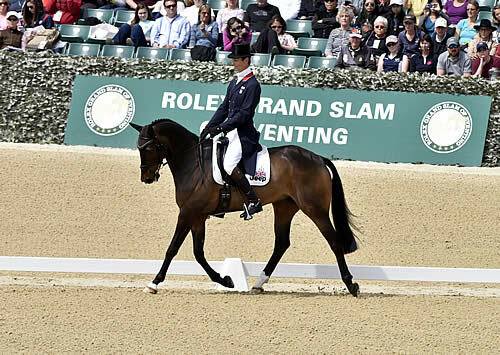 Germany’s Ingrid Klimke was second on Horseware Hale Bob and New Zealand’s Jonathan Paget was third riding Clifton Lush. It was 11 years since Fox-Pitt last won Badminton back in 2004 and he was not going to squander the chance to claim his second victory despite the strong opposition from the high-class field of international riders, with Germany and New Zealand taking four of the other top five final places. Andrew Nicholson (NZL) had led from Day One and he was focused on claiming his first ever Badminton title after 31 years of trying. With the cross-country phase not causing too many challenges for the top-placed riders after dressage, the Kelvin Bywater designed show jumping course was to change everything on the leaderboard. The packed grandstands around the main arena saw only five clear rounds before the final top 10 placed riders jumped, and even two of those clears incurred a penalty time fault. It could not have been more tense going into the final five riders, with just three penalties covering them, the cost of one pole down. Lying in fourth position overnight, Ingrid Klimke came agonisingly close in the end to becoming the first ever German rider to claim the title for a second time, having previously also finished in second place back in 2006. Klimke delivered a perfect clear round to ultimately move her up two places to finish second. Next to go was Great Britain’s Oliver Townend riding Armada who were the 2014 runners-up. Sadly a disastrous round with four poles down took them out of the placings down to 11th position. Both Fox-Pitt and Nicholson, knew they each had to jump a perfect clear to prevent Klimke from winning, but despite this added pressure, Fox-Pitt delivered a faultless performance to the delight of the home crowd who took to their feet to applaud their British hero. This set up an electric climax to the competition as Nicholson entered the arena on his edgy 15-year-old horse Nereo. The crowd collectively held its breath for Nicholson, but it was not to be as the pair crashed through the second fence to hand Fox-Pitt the Badminton title once more. Previous Badminton winner Jonathan Paget (NZL) finished in third place despite hitting one pole down, while eventing legend Sir Mark Todd produced a brilliant clear round of show jumping to move up from joint 15th after dressage to fourth overall; and he could have even claimed third place if not for one time fault in the final phase. Rolex Testimonee Pippa Funnell, riding Redesigned, finished in 12th position overall having climbed from 17th place after a superb ride in both the cross-country and show jumping phases. The win for Fox-Pitt now puts him on course for the $350,000 Rolex Grand Slam of Eventing prize with one step towards claiming the new Rolex Grand Slam of Eventing Trophy, which was officially unveiled at this year’s Rolex Kentucky Three-Day Event by Rolex Testimonee Zara Phillips. Fox-Pitt now heads to the Land Rover Burghley Horse Trials in September, as the live contender of the Rolex Grand Slam of Eventing prize. For full results, please visit: www.badminton-horse.co.uk. When Rolex was inspired to link the three foremost eventing competitions in the world into a Grand Slam in 2001, it was immediately apparent that it would require a series of outstanding performances from a remarkable athlete to complete the challenge. Kentucky, and Badminton – the British horse trials on which the modern sport of eventing was founded – run two weeks apart in the spring, and Burghley, in the east of England, is the autumn highlight of the global sport. All three have stunning settings and attract vast crowds over the four days of competition. To date, only one rider – Rolex Eventing Testimonee Pippa Funnell – has won this most prestigious series. 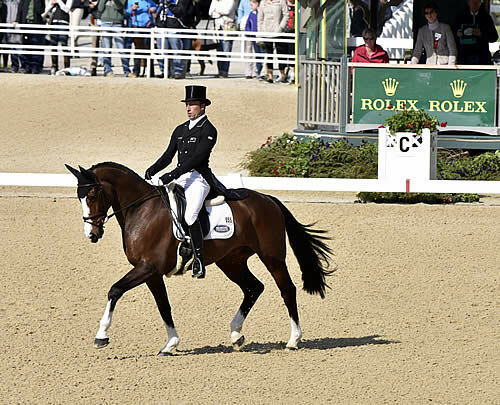 In 2003 the much-medalled mainstay of British teams for many years took the Rolex Kentucky crown on Primmore’s Pride. She progressed to Badminton a week later and won there on Supreme Rock, her double European Champion, and added the Burghley title that autumn on Primmore’s Pride – beating Zara Phillips into second place on her four-star debut at the same time. Pippa Funnell immediately joined the ranks of sporting greats, respected by her peers and the media alike as an exceptional athlete. Since then, two of the three legs of the Rolex Grand Slam of Eventing have been won by four riders: the Australian Andrew Hoy, Britain’s William Fox-Pitt and Oliver Townend, and the New Zealand hero of six Olympic Games and current live Rolex Grand Slam contender, Andrew Nicholson. None of these top-class riders have yet succeeded in triumphing over the series and winning the final element of the Rolex Grand Slam. Leading brand of the Swiss watch industry, Rolex, headquartered in Geneva, enjoys an unrivalled reputation for quality and expertise the world over. Its Oyster watches, all certified as chronometers for their precision, are symbols of excellence, performance and prestige. Pioneer in the development of the wristwatch as early as 1905, the brand is at the origin of numerous major watchmaking innovations, such as the Oyster, the first waterproof wristwatch, launched in 1926, and the Perpetual rotor self-winding mechanism introduced in 1931. Rolex has registered over 400 patents in the course of its history. A truly integrated and independent manufacturing company, Rolex designs, develops and produces in-house all the essential components of its watches, from the casting of the gold alloys to the machining, crafting, assembly and finishing of the movement, case, dial and bracelet. Rolex also actively supports the arts, sports, exploration, the spirit of enterprise, and the environment through a broad palette of sponsoring activities, as well as philanthropic programmes. Lausanne (SUI), 10 May 2015 – William Fox-Pitt (GBR) re-wrote the record books when he became the first rider in history to win a CCI4* on a stallion, jumping a magnificent clear round in today’s final phase on Christopher Stone’s Chilli Morning to capture the Mitsubishi Motors Badminton Horse Trials, fourth leg of the FEI Classics™ 2014/2015. The popular German rider Ingrid Klimke finished runner-up by just 1.2 penalties on her new star Horseware Hale Bob, and New Zealander Jock Paget was third on Clifton Lush, a great achievement on a horse coming back after a year’s lay-off for injury. The finale could not have been more tense, with three penalties – less than the cost of a rail down – covering the first five riders, and all attention on the great Kiwi rider Andrew Nicholson aiming to win Badminton for the first time in 31 years of trying. Paget, lying fifth after Cross Country, eased the pressure on his rivals when Clifton Lush hit the 11th fence to pick up four faults. Klimke, next into the arena, was immaculately prepared, having been competing her German Thoroughbred gelding in Jumping classes over the winter, and they produced a confident clear. Next to go were the 2014 runners-up, Oliver Townend (GBR) and Armada, but the Yorkshireman had humorously predicted that he wouldn’t be taking home any trophies as the 16-year-old gelding is notoriously difficult in this phase. Four fences down dropped the pair to 11th. Fox-Pitt is known for his ability to deal with extreme pressure and the generous Chilli Morning more than rose to the occasion, jumping as if on springs to record a clear and switch the burden onto the shoulders of his New Zealand rival. As the crowd erupted, Nicholson entered on an unsettled Nereo, the 15-year-old chestnut clearly unnerved by the electric atmosphere, and when he hit the second fence it was all over. Two more rails went as well and the pair dropped to sixth place, but the New Zealander somehow managed to find a smile. “I’ll live to fight another day,” he promised. Chilli Morning will now return to stud duties and will not compete again this year. “He’s a fantastic horse with a brilliant brain and he wants to work.” Fox-Pitt was quick to heap praise on Nick Gauntlett, the rider who produced the stallion up to four-star level. Ingrid Klimke said Horseware Hale Bob had given her a great ride in all three phases and she was keen to pay tribute to Chris Bartle, the German team trainer “because he always had faith in us”. Kelvin Bywater’s Jumping track proved influential, with clear rounds at a premium. Sir Mark Todd (NZL) rose from ninth to fourth with just one time penalty on the German-bred Leonidas ll and Bettina Hoy (GER) had her best ever Badminton result with fifth place on Designer 10 after incurring only four faults. Nicola Wilson (GBR) rose 11 places to seventh with a clear round on One Two Many; Aoife Clark (IRL) climbed three places to eighth with four faults on Vaguely North and fellow Irishman Michael Ryan shot up from 21st to ninth with a penalty-free round on Ballylynch Adventure. Last year’s winners, Sam Griffiths (AUS) and Paulank Brockagh, were 10th. Klimke’s second place at Badminton added to her win at Pau (FRA) last year propels her into first place on the FEI Classics™ 2014/2015 leaderboard and she has a good ride, Escada JS, for the fifth leg at Luhmühlen (GER) next month. Fox-Pitt, now second in the rankings, following a fourth place in Kentucky (USA) recently, is also planning to compete at Germany’s premier event, so the contest should go right to the wire at Burghley (GBR) in September. William Fox-Pitt, 45, has won 55 CCIs, including a record 14 CCI4*s: Badminton (2004 and 2015), Burghley six times (1994, 2002, 2005, 2007, 2008, 2011), Luhmühlen (2008), Kentucky three times (2010, 2012 and 2014) and Pau twice (2011 and 2013). He is the only rider to have won five out of the world’s six CCI4*s. Currently the world number two, he won the FEI Classics™ in 2008, 2010, 2012 and 2014. He has represented Britain 18 times in championships, winning Olympic team silver (2004 and 2012) and bronze (2008), world team gold and individual silver on Cool Mountain (2010) plus team silver in 2006, team bronze in 2002 and team silver and individual bronze in 2014 on Chilli Morning. He has six European team gold medals, one team bronze, two individual silvers (1997 and 2005) and an individual bronze in 2013 on Chilli Morning. Fox-Pitt is married to Alice, a television racing commentator. They live near Sturminster Newton, Dorset, and have two sons, Oliver and Thomas, and two daughters, Chloe and Emily. Chilli Morning is a 15-year-old German-bred stallion by Phantomic, a thoroughbred, out of a Jumping-bred mare, Koralle. He was bought in Germany as a youngster by Christopher Stone. Download the FEI Classics™ press kit here: www.feipresskits.org/press_kits/subevent/fei-classics. Michael Jung and La Biosthetique – SAM FBW. Lexington, USA, 24 April 2015 – Michael Jung stamped his class on the 2015 Rolex Kentucky Three-Day Event on Day 2 of the dressage phase by taking the joint lead on his second ride of the competition on La Biosthetique – SAM FBW. Jung also lies in fourth position on his other horse Fischerrocana FST, who was yesterday’s overnight leader. Jung is tied in first place with New Zealand’s Tim Price and Great Britain’s William Fox-Pitt is in third. Unfortunately just minutes before Rolex Eventing Testimonee Zara Phillips was due to compete in her first Rolex Kentucky Three-Day Event in the dressage phase, Phillips had to withdraw due to her horse High Kingdom being lame, having picked up a minor injury earlier in the morning. Jung has happy memories of the Kentucky Horse Park, having become World Champion there in 2010 and now has a double chance of claiming the Rolex title with both his rides going into the cross-country phase tomorrow in top form. However, Great Britain’s William Fox-Pitt who has won the Rolex Kentucky Three-Day Event title three times – in 2010, 2012 and 2014 – is in a strong position lying just 2.2 points behind Jung on his Bay My Hero, and is ready to defend his title. The competition is extremely tight with 37 horse and rider partnerships within just one cross-country fence penalty so everything is to play for. For full results, please visit: www.rk3de.org/results. The first ever Rolex Grand Slam of Eventing Trophy was officially unveiled today by Zara Phillips at the Rolex Kentucky Three Day Event. The magnificent silver trophy standing 60cm was specially commissioned in London and features four stars at the top, with three handles, each representing the three legs of the Rolex Grand Slam of Eventing made up of Kentucky, Badminton and Burghley. Kentucky and Badminton – the British horse trials on which the modern sport of eventing was founded – run two weeks apart in the spring, and Burghley, in the east of England, is the autumn highlight of the global sport. All three have stunning settings and attract vast crowds over the four days of competition. Tim Price (NZL) on Wesko (pictured) is now joint leader with Michael Jung (GER) on La Biosthetique Sam FBW after Dressage at the Rolex Kentucky Three-Day Event (USA), third leg of FEI Classics™ 2014/2015. (Anthony Trollope/FEI). Lausanne (SUI), 25 April 2015 – A fascinating competition is assured at this weekend’s Rolex Kentucky Three-Day Event (USA), third leg of the FEI Classics™ 2014/2015, with three of the biggest names in the sport heading the leaderboard after the Dressage phase. New Zealander Tim Price, riding Wesko, and Germany’s Michael Jung on the 15-year-old La Biosthetique Sam FBW are tied in first place on a score of 36.3. Last year’s winning combination, a beaming William Fox-Pitt (GBR) on the handsome Cult Hero gelding Bay My Hero, is less than two penalties away in third on 38.5. Jung is also in fourth place on the 10-year-old mare FisherRocana FST, on which he was second at Luhmühlen CCI4* last year and won world team gold and individual medals. The pair set the standard on the first day and the German maestro predicted that Sam might find it difficult to beat her excellent mark of 39.3. But the 15-year-old bay gelding presented a delightful picture of lightness and softness to thrill a capacity audience. Wesko, a white-faced Dutch gelding bred for Jumping on which Price scored his first CCI4* victory, at Luhmühlen (GER) last year, is one of the most elegant horses in the business and the up-and-coming New Zealander one of the most accurate riders; the pair presented an attractive picture scored highly for smart trot work and flying changes. Colleen Rutledge (USA), a regular competitor at this level on Shiraz, is best of the home riders in fifth place on Covert Rights, a first-timer at this level, just ahead of CCI4* debutant Mackenna Shea (USA) (Landioso) who, at 22, is the youngest of the 75 starters. Fellow Americans Laine Ashkar (Anthony Patch), 2014 runners-up Lauren Kieffer and Veronica, and Marilyn Little (RF Demeter) are in seventh, eighth and ninth places, separated by just 0.4 of a penalty. Swedish rider Jennie Jarnstrom had the misfortune to be eliminated when her horse Cape Town repeatedly reared and resisted in the Dressage arena and there was huge disappointment when Zara Phillips (GBR), paying her first visit to Kentucky, had to withdraw minutes before her Dressage test on High Kingdom because the gelding had struck into himself in the stable. The first serious question comes at fence 4 on undulating ground, where riders will encounter a big spread followed by five strides to a rail where the ground drops away and then another five strides to a narrow brush fence. Fence 7 is the first of the three water complexes on the course, with a drop into the water and then a large table on the other side of the pond. The famous Head of the Lake at 13 only involves one passage through water this time, but it features a couple of skinny brushes. The keyhole combination at fence 16 and a difficult line to the ‘c’ element, a corner, at the Land Rover Hollow (fence 18) will both have riders thinking hard. And there will be no relaxing for riders on the home stretch. There’s an oxer-corner complex at 24 which has a deceptively tight line and a final water at 26 (which was the fifth fence last year) with a huge carved duck. Follow all the action with live coverage of Cross Country and Jumping on www.feitv.org, live results on www.rk3de.org and interviews on FEI YouTube. Watch Dressage roundup on FEI YouTube: https://youtu.be/PDTD1whdu-4. *NB: Cross Country will now start 15 minutes earlier than scheduled, at 9.45am Kentucky time. Lausanne (SUI), 24 October, 2014 – Two of the world’s most illustrious riders are sharing the lead after the Dressage phase at Les Etoiles de Pau (FRA), opening leg of the FEI Classics™ 2014/2015. Germany’s Ingrid Klimke, riding the 10-year-old Horseware Hale Bob, and William Fox-Pitt (GBR), with the 14-year-old Parklane Hawk, were the only two riders to score below 40 penalties and they are now tying for the lead at this stage on 39.3 penalties apiece. Klimke, who has won numerous team gold medals for Germany, has yet to win a CCI4*. It is her first visit to Pau since the FEI European Championships were held at the French venue, a racehorse-training centre, in 2001. Fox-Pitt, in contrast, is a regular at Pau and has won it twice, in 2011 on Oslo and last year on Seacookie, the horse on which he is currently lying in fifth place with a score of 41.8. Andreas Dibowski (GER), the 2010 Pau winner, is in close contention in third place on FRH Butts Avedon, only 1.4 penalties behind the joint leaders. Britain’s Nicola Wilson was visibly thrilled with her CCI4* first-timer One Two Many after scoring 41.2 penalties. The 12-year-old by Chacoa won the CIC3* at Blair Castle (GBR) in August. The young Belgian rider, Julien Despontin, 25, has made a good start to his first CCI4* and is in sixth place on 43.7 on Waldano 36, just ahead of the Kentucky (USA) runners-up and Pau first-timers Lauren Kieffer (USA) and Veronica (44.2). Pierre Michelet’s (FRA) Cross Country, which follows a twisting route on and off the racecourse and is 30 seconds longer than in 2013, is, as ever, earning the riders’ respect. Fox-Pitt deems it even more challenging than last year. First out on course tomorrow 14.00 CEST is Ireland’s Joseph Murphy on Sportsfield Othello. Follow all the action live on FEI TV (www.feitv.org), with live results on www.event-pau.fr. Lausanne (SUI), 3 September 2014 – The scene is set for a thrilling climax to the FEI Classics™ 2013/2014 at the Land Rover Burghley Horse Trials (GBR) (4-7 September), a perennially popular venue with riders for its iconic Cross Country course, excellent footing, buzzing atmosphere, fantastic shopping and the gracious setting of one of Britain’s great Elizabethan houses. William Fox-Pitt (GBR) has a 10-point lead to win a fourth FEI Classics™ title, but he is not invincible; Oliver Townend (GBR), Tim Price (NZL), Sam Griffiths (AUS), and Phillip Dutton (USA) can all challenge him and Andrew Nicholson (NZL) has an obvious chance to leapfrog into the top five money prizes. Fox-Pitt, who last weekend was the hero of Britain’s silver medal team at the Alltech FEI World Equestrian Games™ 2014 in Normandy, is a record six-time winner of Burghley and has two fancied rides: the versatile Bay My Hero, winner of Kentucky this year, and Burghley specialist Parklane Hawk, the winner in 2011 and third in 2012 and last year. Townend, the HSBC FEI Classics™ champion in 2009, has formed a powerful partnership with the former Andrew Nicholson ride Armada, one of the most athletic horses on the circuit – they were second at a tough Badminton in May and fourth at Burghley in 2012. Price, a CCI4* Luhmühlen (GER) winner this year, had a good Badminton on Ringwood Sky Boy, and Griffiths, the Badminton winner, rides the veteran Happy Times, a horse with a good record at Burghley. Phillip Dutton (USA) invariably rises to the challenge at Burghley and this time brings the handsome Mighty Nice. The combination that will attract most attention, however, is Andrew Nicholson (NZL) and the delightful grey Avebury, who made history with their back-to-back Burghley victories in 2012 and 2013. It would be some feat to make it a hat-trick – the only combination to win a CCI4* three times is Kim Severson and Winsome Adante at Kentucky (in 2002, 2004 and 2005) – but the New Zealand pair have a great relationship. They won two competitive CIC3* – Barbury Castle and Gatcombe Part – this summer and could go close. Around 70 horses from eight nations will be presented at the first horse inspection this afternoon. Among them are such interesting prospects as New Zealand’s Normandy heroine Jonelle Price, riding The Deputy, Belgium’s Karin Donckers (Lamicell Unique), Germany’s Kai Rüder (Gryffindor), world team bronze medallist Andrew Heffernan (NED) (Millthyme Corolla), Australia’s Shane Rose (CP Qualified) and the USA’s Marilyn Little with RF Demeter, sixth at Kentucky in April. The home side’s strongest prospects include Gemma Tattersall (Arctic Soul), Nicola Wilson with the skewbald mare Beltane Queen, Izzy Taylor (KBIS Briarlands Matilda), Sarah Bullimore with Reve de Rouet and Valentino V.
It all kicked off at Pau (FRA) last October when William Fox-Pitt lay first, second and third after Cross Country, eventually triumphing on Seacookie. The following month, Christopher Burton won Adelaide (AUS) on a catch ride, TS Jamaino, a ride he subsequently got to keep. It was Fox-Pitt again at Kentucky in April, clocking up a record 13th CCI4* win, this time on Bay My Hero. Sam Griffiths and Paulank Brockagh came off best at an unpredictable and rain soaked Badminton, and another New Zealand hero was born at Luhmühlen in June when Tim Price (NZL) triumphed on Wesko. Oliver Townend, currently second on the leaderboard, accrued his points at Badminton, where he was second on Armada, and Luhmühlen, where he was fourth on Black Tie. Phillip Dutton, sixth, was fourth at Pau on Mr Medicott and eighth at Kentucky on Trading Aces. By his standards, Andrew Nicholson has had a quiet CCI4* season – his only points come from a fifth place at Pau – but he could easily spring into the reckoning at Burghley. Follow all the action with live scoring on www.burghley-horse.co.uk. At the end of the FEI Classics™ 2013/2014 season, the five riders with the highest number of points collected across the six FEI Classics™ events will share a total prize fund of US$120,000 split as follows: 1st – US$40,000 (Series Champion); 2nd – US$35,000; 3rd – US$25,000; 4th – US$15,000; 5th – US$5,000. Our signature Twitter hashtags for this series are #Classics and #Eventing. We encourage you to use them, and if you have space: #FEI Classics™ #Eventing. Normandy (FRA), 30 August 2014 – Germany is still on course to win team gold at the Alltech FEI World Equestrian Games™ 2014 in Normandy, but Great Britain has closed the gap after a thrilling day’s Cross Country during which the huge cheering crowd witnessed some truly outstanding horsemanship. Britain, the only team to have four clear rounds, has risen from fifth to second place and is within three Jumping fences of the Germans. Australia is now third, France fourth and Netherlands sixth after the dramatic departures of the New Zealand and US teams. William Fox-Pitt (GBR) conjured a brilliant performance from Chilli Morning and now heads the individual Cross Country leader board, on a score of 50.3. But the British camp is in subdued mood after the sad loss of Wild Lone, the horse ridden by team anchorman Harry Meade into 25th place with 26.4 time penalties, which collapsed and died after the finish. Despite the devastating tragedy for Harry Meade, he was determined to state that he felt the Cross Country course played no part in Wild Lone’s death. There were 40 clear rounds and 63 completions from the 87 starters, including many excellent displays of sympathetic horsemanship. An exciting Jumping phase is in store tomorrow as only 2.2 penalties cover the first five riders on the individual leader board. The Dressage leader Sandra Auffarth (GER) had a superb round on the powerful French-bred chestnut Opgun Louvo. She added 16.8 time penalties compared to Fox-Pitt’s 12.8, and is now in second place just 1.7 penalties adrift on a score of 50.2. Auffarth’s team mate, defending champion Michael Jung (GER), proved an inspirational pathfinder on the relatively inexperienced nine-year-old fischerRocana FST. Jung is now third on 50.3 and could easily become the first rider to win back-to-back world titles since Bruce Davidson (USA) in 1974-78. Ingrid Klimke (GER) incurred 32.4 time penalties on FRH Escada JS and is now in 21st place, while Dirk Schrade is Germany’s discard score after two run-outs on Hop and Skip. The New Zealand team had a less than happy day, but individual rider Jonelle Price produced the class round of the day, finishing with fastest time to collect just four penalties, rising 22 places to fourth on the neat little thoroughbred Classic Moet. Andrew Nicholson (NZL), the only remaining member of the Kiwi team, also made Pierre Michelet’s exacting course look easy and produced the second fastest time, for 7.2 penalties. He is now in fifth place on a score of 52.5 on Nereo and is another within touching distance of becoming his country’s fourth world champion, following Blyth Tait (1990 and 1998) and Vaughn Jefferis (1994). New Zealand’s pathfinder Mark Todd fell when Leonidas ll tripped on landing up the step out of the water at fence 30, which was the most influential obstacle. Then Tim Price on a tiring Wesko was pulled up by stewards near end of the course. Jock Paget, third after Dressage on Clifton Promise, was left to go all out for an individual medal, but pulled up after a run-out at the second corner at fence 5 and plans to re-route to Burghley next weekend. The USA team was eliminated when their first two riders, Buck Davidson (Ballynoe Castle RM) and Phillip Dutton (Trading Aces), both retired. Their best rider is Boyd Martin, who is in ninth place with Shamwari. Badminton winners Sam Griffiths and Paulank Brockagh, 17th, were excellent pathfinders for the Australian team, who are now in bronze position. With the team down to three riders, following the withdrawal of Christopher Burton’s TS Jaimaino due to colic, there was great pressure on Shane Rose (Taurus, 30th) and Paul Tapner (Kilronan, 13th), who both went clear. The French team is fourth, with their youngest rider, Maxime Livio, the highest-placed in eighth on Qalao des Mers. “I have never ridden with such patriotic support, not just for French riders but for every nation,” he said. There were many notably determined performances, including that of British pathfinder Zara Phillips, for whom this was by far the biggest test since giving birth to her daughter Mia in January. She survived an alarming moment at the bounce of hedges after the water at fences 17-18 and found herself hanging perilously out of the back of the saddle, but recovered well and is now in 15th place on High Kingdom. Tomorrow, there will be a final Horse Inspection at Haras du Pin before the horses are driven to Caen for the Jumping phase which starts in the main D’Ornano Stadium at 14.00 CEST. Follow all the action on FEI TV (www.feitv.org) and with live scoring on www.normandy2014.com.